MPs with Science Degrees: How did Science & Technology do in the UK General Election 2015? Tags: Alan Brown, alec shelbrooke, Alok Jha, Alok Sharma, Carol Monaghan, case, Chi Onwurah, Chris Philp, david davis, david willetts, Davide Castelvecchi, Elizabeth Gibney, gavin barwell, Geek Manifesto, graham stringer, Jo Johnson, julian brazier, Julian Huppert, karen bradley, Lewis MacKenzie, liam fox, Liz McInnes, margaret beckett, Margaret Harris, Mark Henderson, Mark Hendrick, nadhim zahawi, PPE, Richard Dawkins, robert flello, Roger Highfield, Sarah Kendrew, Sarah Wollaston, Stephen Timms, Therese Coffey, Tom Brake, valerie vaz, Viva La Relativity! Can it really be true that Julian Huppert, just defeated in Cambridge, was the only scientist MP? Surely not? … and lots of people weighed in (see below) – as they usually do on twitter. Thankfully Margaret Harris at Physics World, set the record straight and drew attention to the impressively large Physics Vote. Viva La Relativity! So there are at least 26 MPs out of 650 total who have some kind of STEM educational backgrounds, and hopefully several more. Thankfully, much better than none – but still not that high considering the proportion of STEM in the general population. This article MP’s Degrees: What do they know? claims there are many more scientific MPs, but it depends what you mean by Science of course. Over at the Science Campaign, they have counted 83 politicians with a background or “interest in” science. Doesn’t everyone have an interest in Science & Technology at some level? If so, there are 650 out of 650 MPs (100%) with an interest in science and technology then? As for MPs who have an actual science education, your mileage may vary, especially if you think Politics, Philosophy and Economics (PPE) are all sciences. Wannabe sciences? Yes. Actual Sciences? No. In an ideal world where politicians create policies based on evidence, rather than finding evidence to fit their policies, how many scientists and technologists do we actually need in our government? Would it actually help make for better policies? @dullhunk @HairAndBeardGuy @julianhuppert What about Carol Monaghan, MP for Glasgow North West? BSc in Laser Physics. @andrewwr235 @dullhunk 27? They were very well disguised! @rogerhighfield studying physics doesn't get you into the bullingdon club…? Please find enclosed a copy of a new book by Mark Henderson, titled “The Geek Manifesto: Why Science Matters”. I hope you will enjoy it as much as I did. The book laments the undervalued role of science in politics on pressing issues such as the global economy, healthcare, education, justice and the environment. For many politicians, science is a tool to be exploited when it supports an existing policy position, and an inconvenience to be discarded when it does not. As Henderson puts it, the cynical quest for policy-based evidence has trumped the desperate need for evidence-based policy. This is not surprising since only 1 in 650 British MPs has a Science qualification and his name is Julian Huppert. Your conservative colleague Adam Afriyie is proposing compulsory science literacy lessons for MPs in order to tackle this serious problem, but there is still a long way to go before science becomes integral to political decision making. As well as the serious issues the book raises, it is also very positive and inspiring. The state of affairs it describes can not be blamed politicians alone. It is also the fault of people who value science and evidence based decision making – the “geeks”. We geeks must engage in the political process, not stand on the sidelines and moan – this is the geek manifesto. This thinking led me to join a campaign for people to buy a copy of this book and send it to every MP in the UK set up by Dave Watts. The book you now have is a direct result of this campaign, which you and 649 other members of parliament now have a copy of. Despite the recession and challenging economic circumstances, over 300 ordinary voters like me have spent their own time and money in order to send you these books. Please take the time to read your copy of the book. If politicians can learn from geeks, and geeks can learn from politicians, we will all get wiser and decision making can only improve. I would be especially interested to hear if and how this book has changed your decision making and will post any of your replies here on my blog. P.S. A copy of this letter has been sent by post accompanied by a hardback copy of the Geek Manifesto. Another copy of this letter has been emailed to david.rutley.mp@parliament.uk. Some of the content of this post has been adapted from letters authored by Dave Watts and Chris Chambers. 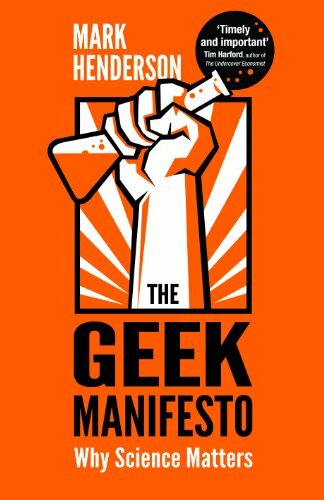 Thank you for your email of 18th June and letter enclosing a copy of the Geek Manifesto. It was very thoughtful of you to think of me and I appreciate you sending me a copy of the book. Like you, I believe it is important that science subjects are well represented in the House of Commons and society as a whole. It is important that young people are encouraged to study STEM subjects, so that the UK can compete on the international stage and our universities can continue to be world leaders in scientific research. I will be sure to bear the views put forward in the Geek Manifesto in mind during my work in the House of Commons and in my conversations with Ministers. Thank you once again for taking the time to send me a copy of the Geek Manifesto. I look forward to reading my copy.